Welcome sun-filled days, crisp air, and fresh blooms with this sweet floral springtime inspired ice cream. 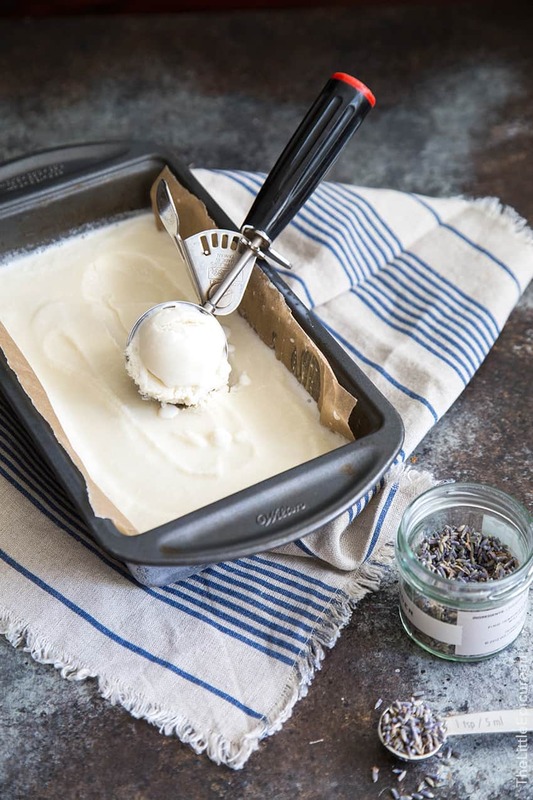 Grab your picnic blankets and let’s enjoy all the honey lavender ice cream al fresco! Lavender and honey is a delicious combination that I am just learning to appreciate. Since moving to Pasadena, I’ve been frequently this cute little espresso bar, aptly named Lavender and Honey. 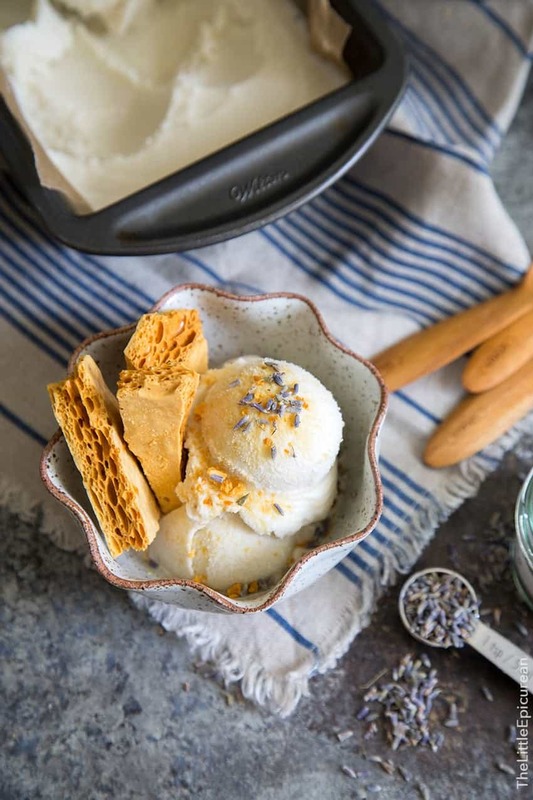 Prior to this honey lavender ice cream, I’ve also associated lavender with soaps, potpourri, and perfumes. I couldn’t imagine eating it. I’ve shied away from all things lavender for too long. This honey lavender ice cream won me over. 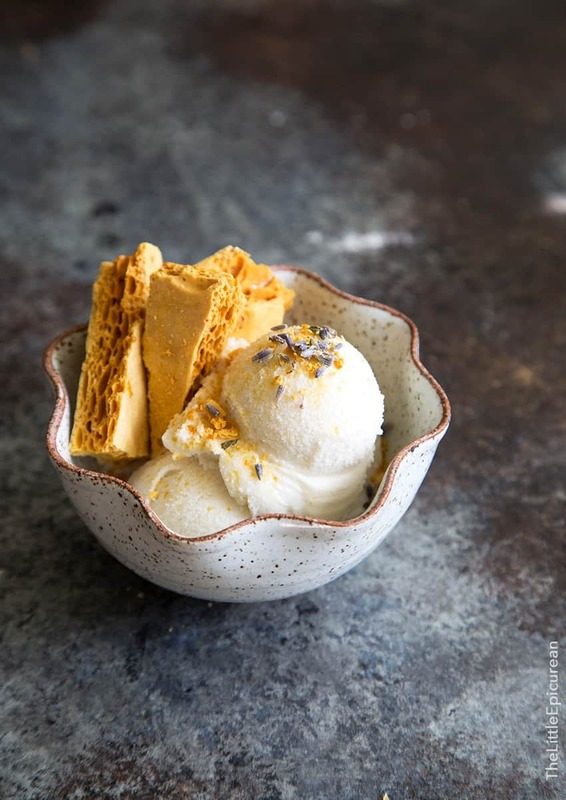 Honey lavender ice cream is lightly sweet and floral. It’s wonderful during the spring months. It’s all at once delicious, relaxing, and calming. The sweet floral notes of the dried lavender pairs wonderfully with honey. 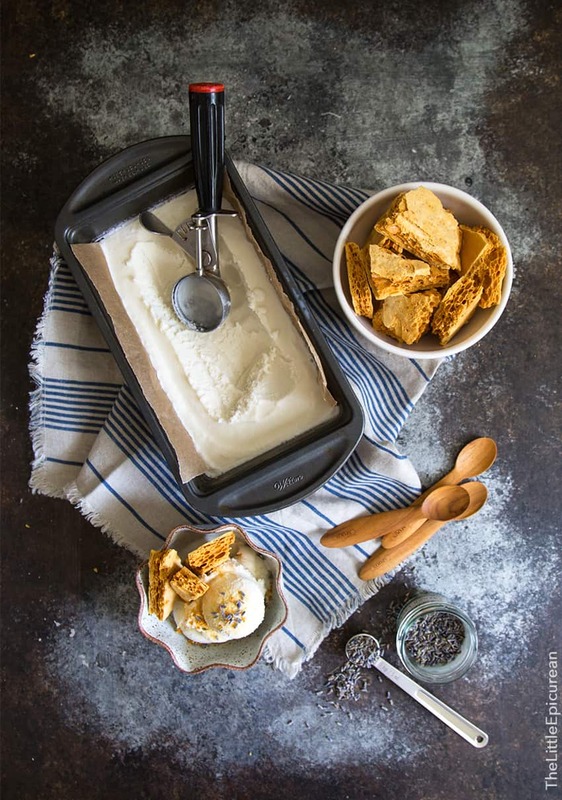 When paired with crispy, crunchy honeycomb toffee, this ice cream is unstoppable. It’s probably the fanciest looking ice cream I’ve ever made. 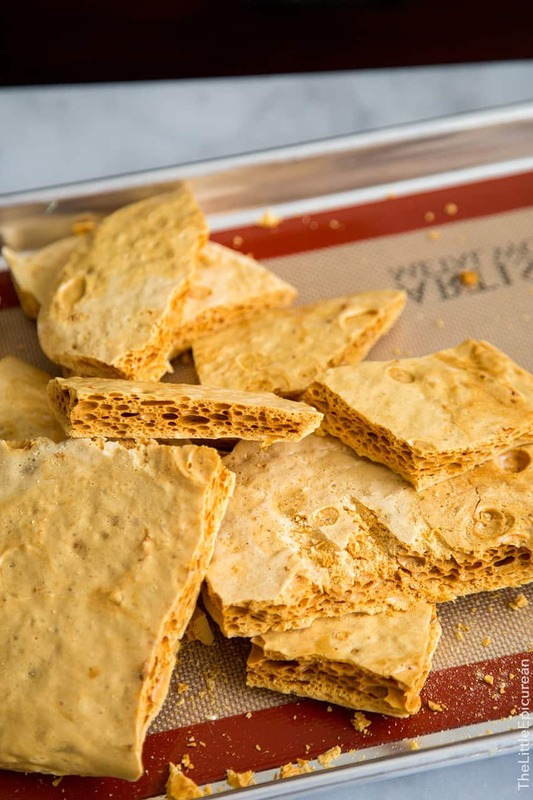 This is the same honeycomb toffee used in this peanut butter honeycomb pie. Grab a bowl and dig in. This is the kind of ice cream that doesn’t last long in the freezer. You’ll finish it faster than you thought possible. Where to buy dried lavender for ice cream? Be sure to use culinary (food grade) dried lavender. Don’t use the stuff for potpourri! I bought my lavender from Williams-Sonoma. You can also purchase it at various online retailers (like Amazon) as well as your local Whole Foods market. In a heavy bottomed sauce pot, combine milk, heavy cream, and 2 tablespoons sugar. Set over medium-high heat and bring to a simmer. Stir often to ensure milk does not burn along the edges of the pot. Remove from heat and add dried lavender. Cover pot and let lavender steep for 1 hour. Strain lavender. Measure liquids. Add additional milk until you have 3 1/2 cups of liquid. Add remaining 2/3 cup sugar and 1/4 cup honey. Set over medium heat. Stir often and cook until sugar has dissolved. Remove from heat. Add pinch of salt. Stir to combine. Transfer liquid to an airtight container and allow to chill in the fridge overnight to mature. The following day, freeze mixture in ice cream maker according to your unit's instructions. Process until the volume of ice cream has increased by half and it has reached a soft serve consistency. Transfer to a freezer safe container and let rest in the freezer for at least 2 hours before serving. Allow to sit at room temperature for 3-5 minutes before scooping and serving. Garnish with honeycomb toffee. I used Bon Appetit's honeycomb recipe. Be sure to use culinary dried French lavender (food grade). I purchased mine from Williams-Somona. You should be able to find it at various retailers online, as well as your local Whole Foods or well stocked markets. What a beautiful flavor combo! Flawless! This makes me want to don a bonnet in the best possible way. Saving this recipe for later! Not everybody knows that the icecream mixture should be left to mature, I read it on a professional cookbook. I haven’t made any icecream yet and I’m glad to see here that it works! Do you think that it would be possible to make a cold infuse of milk-cream-and-lavender? Thank you? I’ve made this honeycomb twice now. Both times I followed the recipe exactly. It’s ferocious! However, mine is coming out as more of a thin brittle. It does not look as light and airy as the pictures. Any suggestions? Try using new baking soda. I was wondering if you ever tried putting the honeycomb toffee into the ice cream? Also I do not have an ice cream maker. Would I just have to put the ice cream into a container and stick it in the freezer until it’s ready?